area = α + β + γ - π. 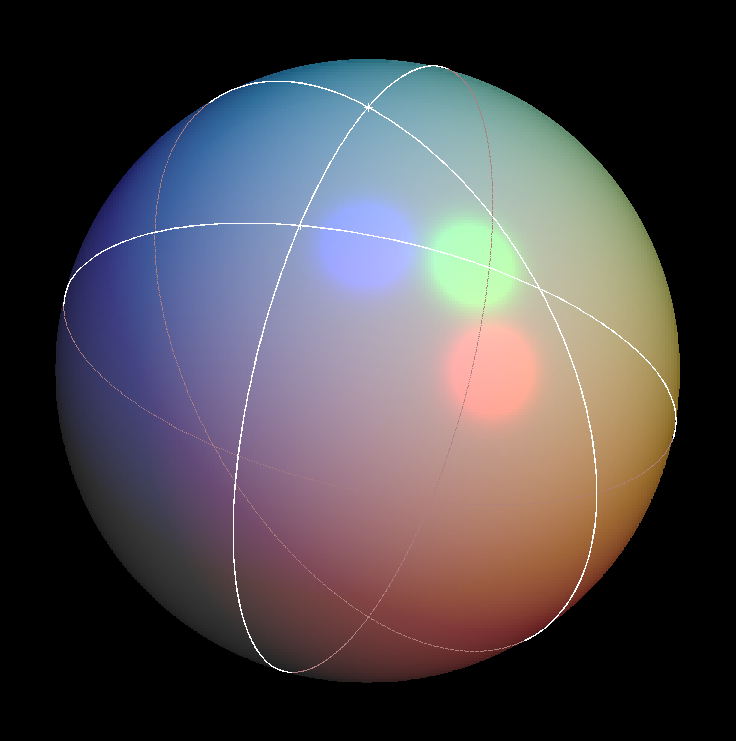 The sphere is almost always parametrized with so called “geographical” or “spherical” polar coordinates. Geographers measure the latitude from the equator, i.e. between -π/2 and π/2 . Angle preserving “stereographic” projection of the sphere from the south pole to the tangent plane at the north pole. Archimedes' area preserving horizontal projection from a tangential cylinder to the sphere. Mercator's angle preserving generalized projection from the sphere to a circumscribed cylinder, giving the Mercator maps of the earth. 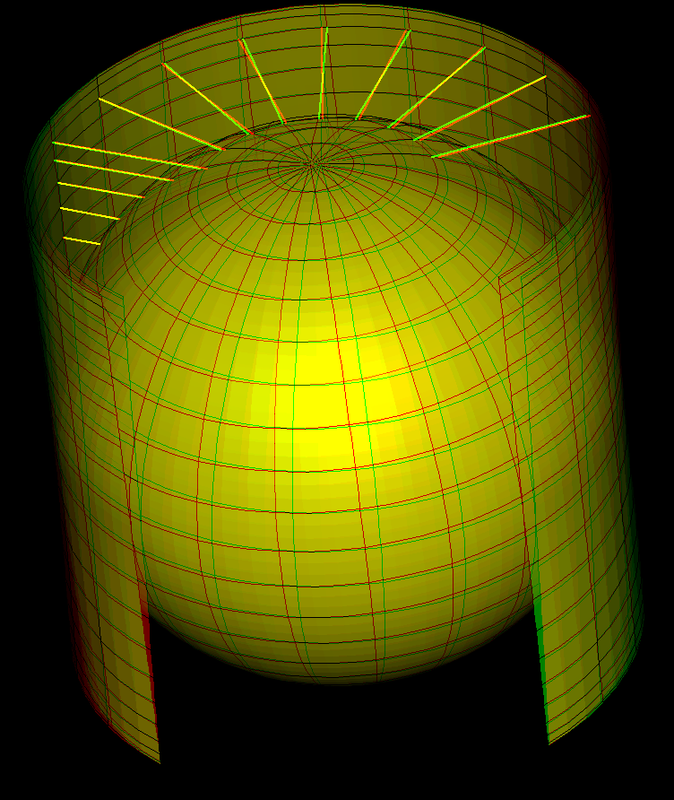 And, again from Archimedes, volume comparison of cylinder, cone and half sphere. Stereographic projection is the projection of the sphere from one point to the tangent plane at the antipodal point. We call the projection center “south pole”. The stereographic image of a circle through the south pole is a straight line (see image), namely the intersection of the circle plane with the image plane. Observe that the image line is parallel to the tangent of the projected circle at the south pole. This says: Two circles through the south pole intersect with the same angle as the image lines of the two circles. This almost proves: stereographic projection is angle preserving. We only need to add: every tangent to the sphere (not at the south pole) is tangent to a unique circle through the south pole. Why is that true? Take the (unique) plane which is spanned by the south pole and by the given tangent to the sphere. Intersect this plane with the sphere to get the desired circle through the south pole. 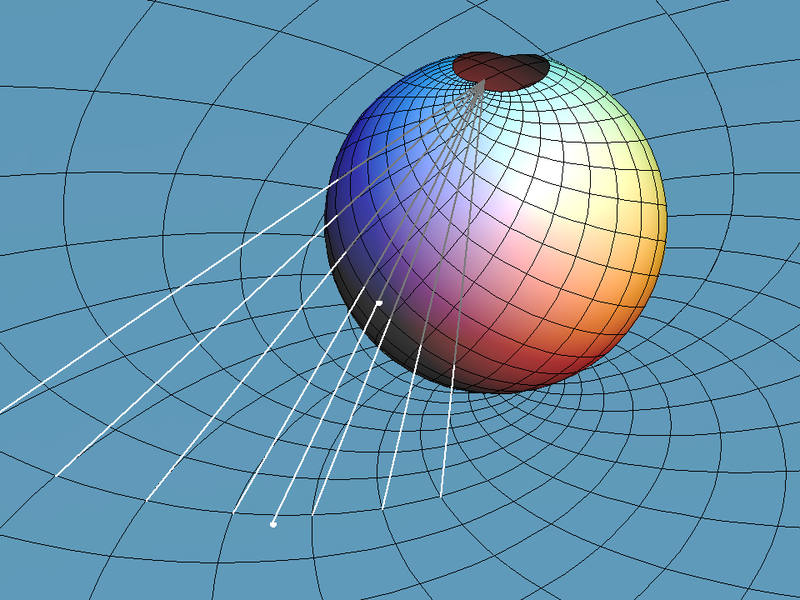 Sphere with loxodromic grid and stereographic projection into a tangent plane. In the animation we change the angle of the loxodromes against the meridians (of the sphere) or the radial lines (from the origin of the plane). The grid in the plane is obtained by applying the complex exponential to a rotating cartesian grid. A sphere with a loxodromic grid rotates around the x-axis. Stereographic projection from (0,0,1) to the opposite tangent plane (z = -1) shows the corresponding group of Moebius transformations. 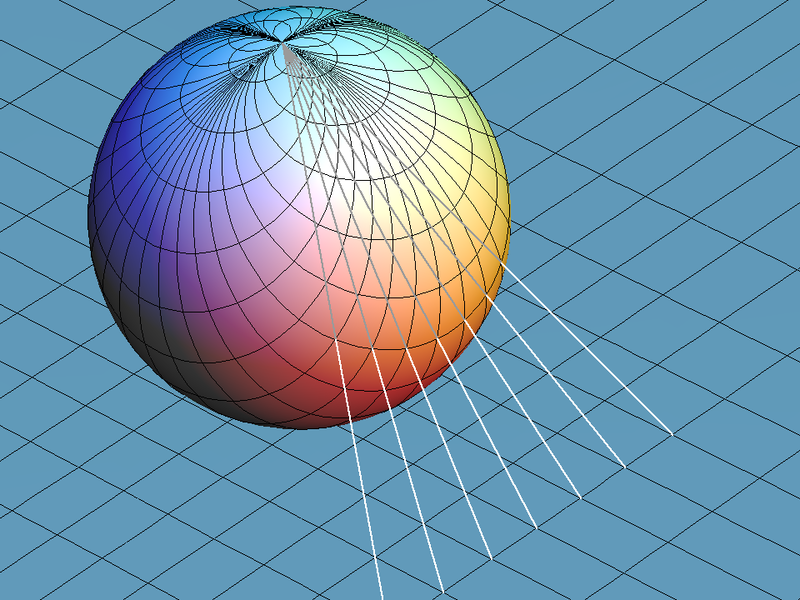 The fixed point (1,0,0) of the sphere rotation is marked and projected to a fixed point of the Moebius rotation. 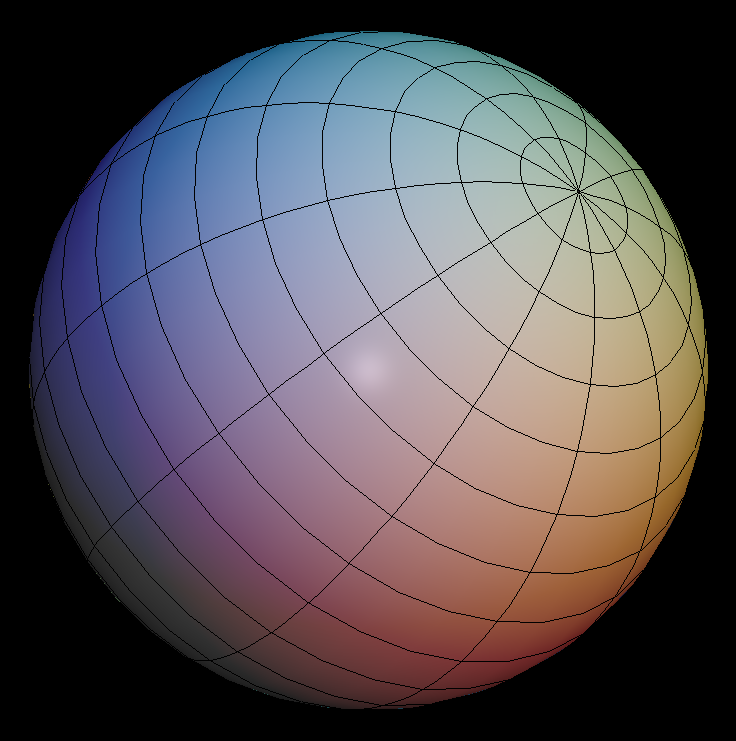 Archimedes has observed that the radial horizontal projection from a cylinder, that touches a sphere along the (horizontal) equator, is area preserving. This implies immediately that the unit sphere has area 4 π. If u is the polar angle from the north pole then a latitude circle is at height cos(u) above the equator and has radius sin(u). It is shorter by the factor sin(u) than the (preimage-) latitude circle on the cylinder (radius = 1). The vertical lines on the cylinder are mapped to the longer meridians on the sphere. These vertical lines are not stretched uniformly, but at height cos(u) they are locally stretched by the factor 1/sin(u) - because the vertical line and the sphere tangent to the meridian at height cos(u) intersect with angle u. This shows: Archimedes projection shortens horizontal directions by the factor sin(u) and stretches vertical directions at height cos(u) by the factor 1/sin(u). And sin(u) * 1/sin(u) = 1 means: the projection is area preserving. 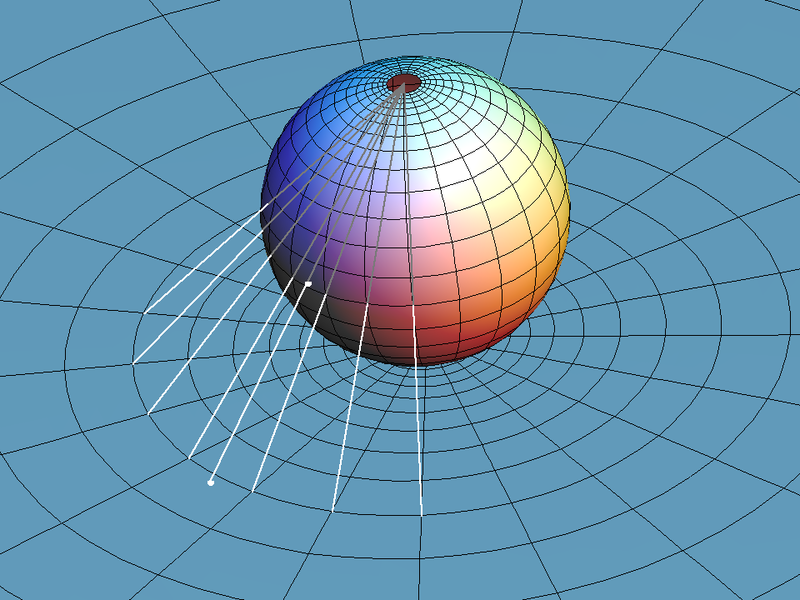 Sphere with polar grid rotates around x-axis in steps of 20 degrees. The grids are stereographically projected from (0,0,1) to the opposite tangent plane (z = -1). The fixed point (1,0,0) of the sphere rotation and its image point are marked. 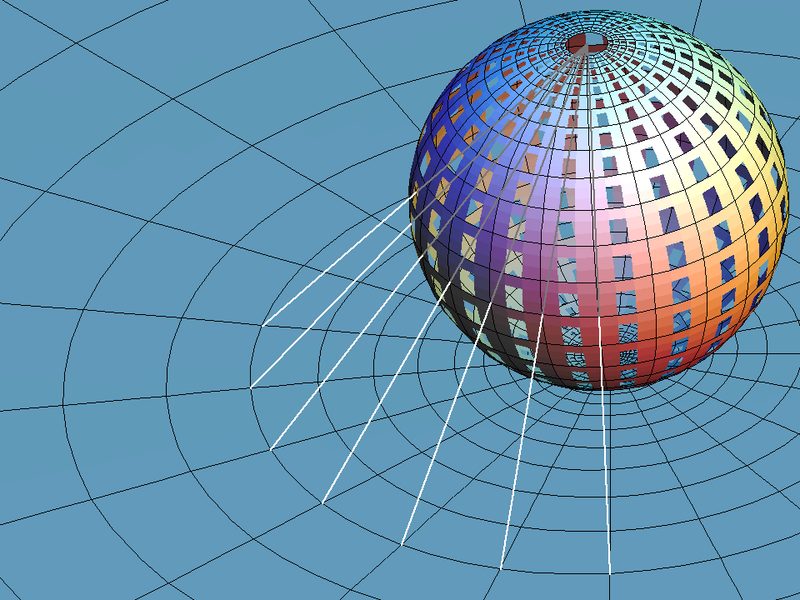 The projection of the rotating grid on the sphere shows a group of Moebius transformations in the plane. Note that 180 degree rotation of the sphere is projected to inversion z ⟶ 1/z. The animation therefore shows a homotopy from the identity through the inversion back to the identity. 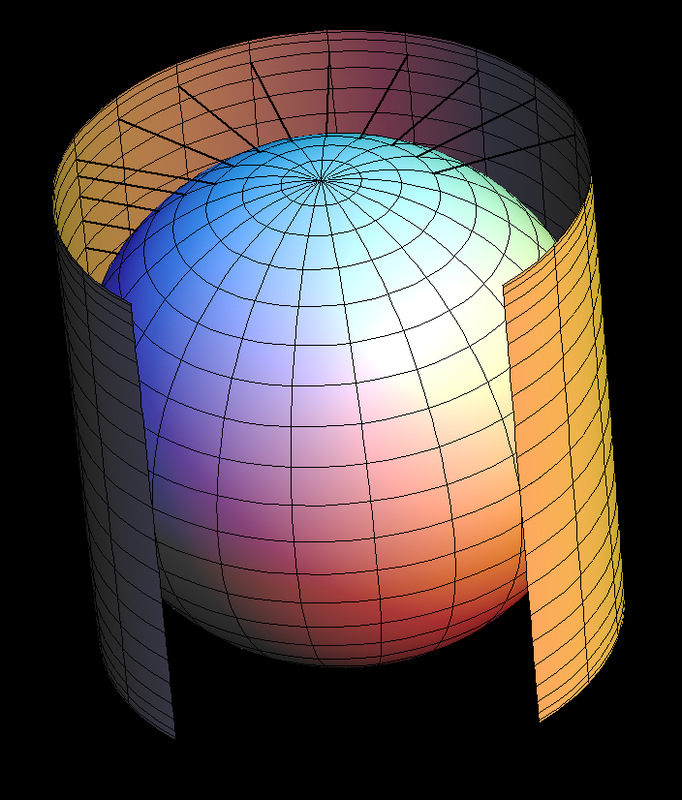 Archimedes area preserving projection from circumscribed cylinder to sphere.